Today, in its annual General Assembly CEWEP elected a new President, Mr Paul De Bruycker, representing CEWEP’s Belgian member, Belgian Waste-to-Energy (BW2E). 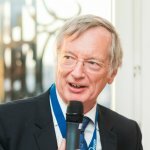 Mr De Bruycker replaces Ferdinand Kleppmann, the founder of CEWEP and President of more than 15 years who takes a well-deserved retirement. “What CEWEP has achieved in the last 15 years makes me very proud. CEWEP has gained trust through a steady and solid delivery of information and facts, this way being a reliable partner to the EU Institutions and other stakeholders on all items surrounding Waste-to-Energy and sustainable European Environment policy. Our members contributed enormously to environment and climate protection”, said Mr. Kleppmann. The new President also sees a bright future for the sector. “More than ever Waste-to-Energy will play an essential role in the realisation of a sustainable integrated waste management approach. Waste-to-Energy will not only deal with non-recyclable waste and turn it into energy and valuable products but will also play an essential role in making the circular economy happen” said Paul De Bruycker during a speech at CEWEP’s 15th Anniversary reception in Brussels’ Museum of Musical instruments. As part of CEWEP Presidency elections two Deputy Presidents were re-elected: Mr. Filippo Brandolini, Utilitalia, Italy and Mr. Michiel Timmerije, Dutch Waste Management Association, Netherlands and three Deputy Presidents were elected for the first time: Mr. Hubert de Chefdebien, SVDU, France, Mr. Jacob Simonsen, Danish Waste Management Association, Denmark and Mr. Carsten Spohn, ITAD, Germany. CEWEP was founded in 2002. Today with members from 22 countries CEWEP represents about 80% of the Waste-to-Energy market in Europe.